Russian Defense Ministry may be able to conclude contracts with former soldiers and officers to carry out specific combat missions during military operations. 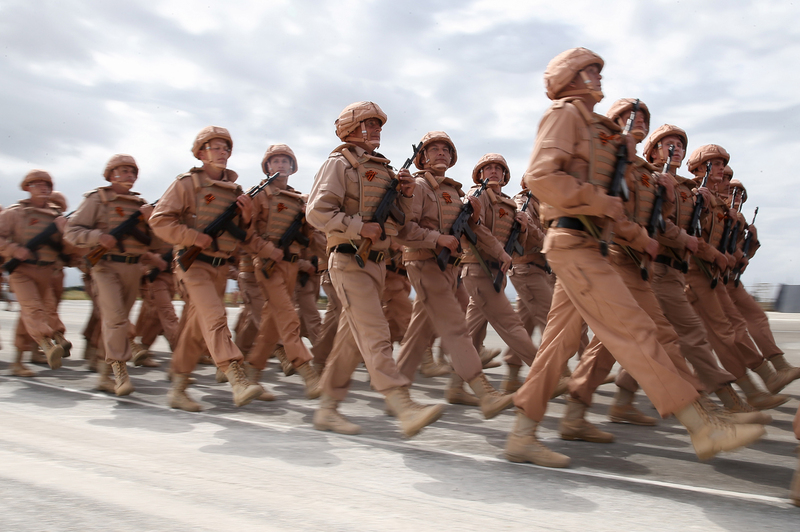 Photo: Russian soldiers march at Hmeimim airbase in Syria on May 5, 2016. Proposed amendment’s to Russia’s law on military service would allow soldiers to sign up for operations to fight terrorists abroad. The Russian Federation’s Legislative Commission has approved amendments allowing short-term contracts with military personnel for participation in Russia's international operations to combat terrorism. If the law is adopted, the Defense Ministry will be able to conclude contracts with former soldiers and officers to carry out specific combat missions during military operations, particularly in Syria. According to the law "On Military Duty and Military Service," a soldier or sailor is signed to a paid service contract for either two or three years, depending on the branch of the armed forces. At the same time, according to the Defense Ministry, every fifth potential soldier is interested in signing a contract for a shorter period for a specific join operation to fight terrorists, rather than to first serve with a regular military unit within Russia’s borders. Changes to the law will apply to Russian citizens who are currently serving in the armed forces reserve or are preparing to perform their mandatory military service. According to the Defense Ministry, young men and women will be able to conclude a contract to participate in an international operation "for the period until the termination of the circumstances which have caused such a need," but for no more than a year. According to Ivan Konovalov, director of the Moscow-based Center for Strategic Trend Studies and the author of the book "The Evolution of Private Military Companies," this initiative will allow veterans who have proven themselves during the wars in Yugoslavia, Iraq and other hotspots to return to combat operations. "We have long been fighting in modern conditions; we need to form groups and forces for specific purposes," Konovalov said. "In such a way, it is possible to assemble a team of professionals selected for a particular task on different war fronts." It will also allow give the armed forces access to experienced personnel with specific skills. "If we talk about the Syrian operation, it requires forward air controllers, bomb squad engineers, signalers — a limited group, which is easier to form on a case-by-case basis, rather than transfer an entire unit to the war zone," Konovalov said. According to Colonel General Leonid Ivashov (ret. ), president of the International Center for Geopolitical Analysis, the proposed law is the first step toward the legalization of private military companies in Russia. "These groups are widely used by Western countries in military operations around the world. We also need them," Ivashov said. He added that a structure within the Ministry of Defense will need to be created to oversee the selection process of individual soldiers. "It is necessary to avoid corruption and prevent mentally unbalanced and non-professional people from entering the ranks of soldiers," Ivashov said. "This is a question of the country's image abroad." This short-term contract model is not new for the Russian armed forces. Colonel-General Sergei Makarov, a former commander of the North Caucasus Military District told the Gazeta.ru (in Russian) online newspaper, Russia had a similar program in place during military campaigns in the North Caucasus. In his comments to the paper, Makarov echoed the assessment of Ivashov that such contract soldiers should be carefully vetted. "It is very important that the selection of people for the conclusion of short-term contracts is no less thorough than for long-term ones," Makarov said. Otherwise, he said, the programs could attract those who are poorly educated and ill-prepared and are only interested in a paycheck.